News - Definitely Maybe for Oasis reunion? Definitely Maybe for Oasis reunion? The warring brothers, who fronted the group until their split in 2009, are said to have been approached by concert promoters to play two shows in August 2014, to mark the 20th anniversary of their debut album Definitely Maybe. 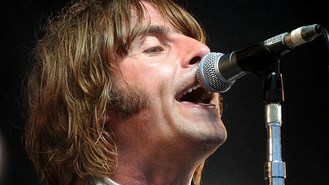 A source told the Daily Mail: "If the gigs happened, they would perform Definitely Maybe from start to finish." The gigs are thought to be at Knebworth, where Oasis broke the record for fastest-selling tickets in British history when they played at the venue in 1996. Younger brother Liam has hinted that a reunion could take place, saying in June: "I'd do it for nowt, but if someone's going to drop a load of f*****g money, I'd do it for that too." In 2011, he told the Independent: "It was him (Noel) that started the idea and now he's saying he's not up for it, but I am. If the people want it, then the people will get it." But in August, his elder sibling Noel denied the reports: "It definitely won't happen. Look, who knows what will happen in 20 years? But 20 years from now... I'll hopefully have retired by then."